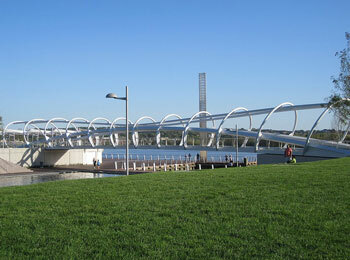 One of the newest parks in the Washington area, the Yards Park on the Anacostia River was completed in late 2010. It combines a large grassy area, waterfall, fountains, a scenic bridge across a canal, and riverside gardens. The park is the site of summertime concerts and other activities in the new Southeast DC waterfront development. Forest City Washington 10 Water Street S.E.